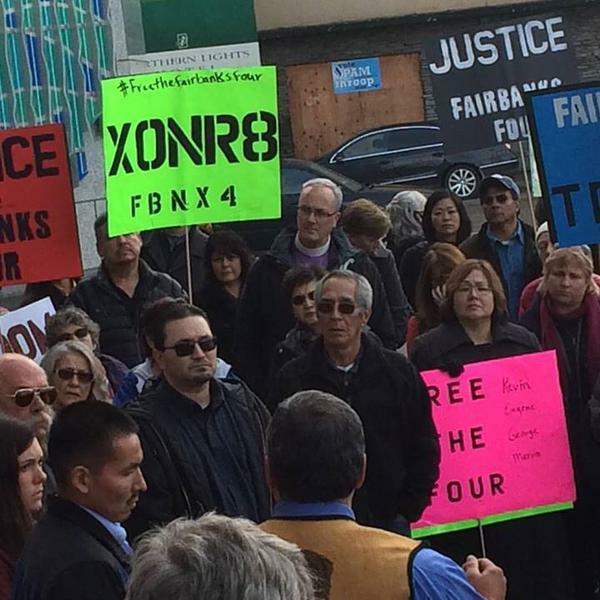 October 5, 2015 marked the first day of proceedings in the evidentiary hearing the Fairbanks Four, their attorneys, and supporters hope will ultimately lead to their exoneration. Inside the courtroom, Marvin Roberts was flanked by attorneys, his traditional beaded moosehide vest among the black suit jackets underscoring his singularity in the courtroom. His three – sat a few miles away at Fairbanks Correctional Center, where the State had been ordered to transport them. The court was, however, unable to force the State to transport them under guard the few remaining miles to the courthouse each day when the State refused. Equally alone, and every bit as tasked with the burden of representing those who could not be there in person, was Chris “Sean” Kelly, the elder brother of victim John Hartman. Nearly eighteen years have passed since the last time this case was in court, and the years have altered many in the crowd. Accused man Marvin Roberts, the only one of the four to achieve parole, and Hartman’s brother Sean Kelly are middle-aged men now. Hazel Roberts, mother to Marvin, has gray streaking her hair now, and is on the doorstep of 60. The last time she sat behind her son proclaiming his innocence she was nearly the age he is today. Hartman’s mother is long deceased. Also present at court was George Frese’s daughter with her daughter on her lap. Today, she is twenty years old, and her daughter is three. In 1997 she was a three-year old on her mother’s lap and her father George was twenty. The years calculated in their alteration of the human beings involved are painfully visible. The rows of spectators listened carefully as the case began. Immediately prior to proceedings, journalist Brian O’Donoghue, whose investigative reporting first revealed the many issues with the original convictions to the public, was unceremoniously ejected from the courtroom. State prosecutor Adrienne Bachman deposed both O’Donoghue and blogger April Monroe, making them witnesses to the case, in what many suspect was an effort to execute control over coverage of the proceedings. The crowd shook their heads as O’Donoghue rose and walked from the courtroom, unable to cover the story for the first time since its inception. During opening statements attorneys for the men and the State of Alaska outlined their respective cases. The Fairbanks Four, as George Frese, Kevin Pease, Eugene Vent, and Marvin Roberts have come to be known, are visibly well represented on this return trip to court. The eighteen years that have elapsed since their original conviction have virtually inverted the appearance of the courtroom – a reflection of the change in public sentiment about the case. The attorneys for the Fairbanks Four sat two tables deep, and opening statements were given in turn by the lead counsel for each of the men. The Fairbanks Four, their attorneys argued, are entirely innocent of the murder of John Hartman. 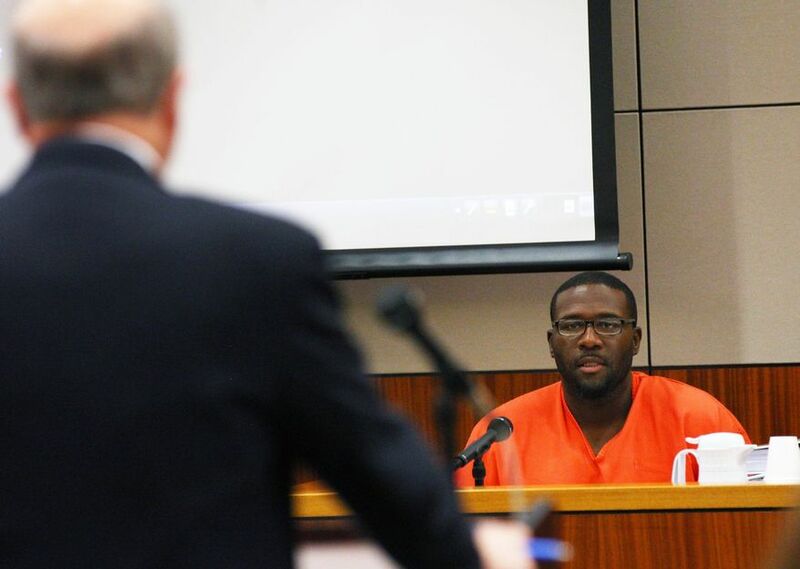 In an opening bolstered by a series of video clips – William Holmes unemotionally confessing to the murder of Hartman in detail, his co-conspirator Jason Wallace implicated by both Holmes and his own statements cockily invoking his right against self-incrimination when asked about his role in the killing, and former star witness Arlo Olson recanting his original testimony – attorneys for the Fairbanks Four argued passionately that their clients were absolutely innocent, as they themselves have insisted since the first day of incarceration and maintained these many years. Adrienne Bachman argued for the State of Alaska that jury trial is the “bedrock of the justice system,” that the judge had no business being a super-juror in the case, and went on to say she would call witnesses who bolstered the original case, including a cab driver who came forward in 2014 to claim she saw four “Asian-looking men” in the Barnette area the night of the murder, and “felt a catch in her heart.” She outlined a basic argument for countering the admissibility of anything she deemed hearsay, communicated her intention to stand by the boot print exhibit created by controversial figures Jeff O’Bryant and Aaron Ring, and exhibit repeatedly described as misleading and totally unscientific by experts, reiterated that alibi witnesses should not be called because if “they were not believable the first time, they are not believable now.” Bachman also revisited the testimony of Melanie Durham, a women’s shelter resident in 1997 whose testimony about hearing the Hartman beating has long been used as a reference for the time of the crime. Durham came forward when she realized the beating she heard had resulted in a death, claiming to have heard “dark” voices and a smaller voice plead for help. After the Fairbanks Four were arrested and she had a conversation with officer Aaron Ring, accused by supporters of significant misconduct in the case, Durham altered her story to be that although she was not close enough to hear audible words, and she saw nothing, that she was still able to identify the voices as Native due to an accent (as an aside – none of the Fairbanks Four have a “Native” accent, all are verified city boys). Durham’s illogical but racially charged testimony was effective the first time, and Bachman argued that Durham did not hear a black man, despite Holmes’ having a classic “African-American speech pattern.” It was an interesting addition to the theory that witnesses can distinguish Natives in the dark distance by indistinguishable speech – the State expressed their stance that this is also true of African Americans. In the end, both sides argued what is to be expected – the attorneys for the Fairbanks Four argued based on fact and witness testimony that their clients are actually innocent of the crime for which they have spent the last 18 years in prison, and Adrienne Bachman argued that she did not want to be there and did not think it was fair that her opponents were presenting this information in court. Oh, also that her witness has the superpower of identifying people by ethnicity without seeing them, and that she has a witness who may have seen four Asians in 1997, because that is close enough, right? In all reality, it is dismaying to say the least to hear bigotry presented as fact in 2015 as in 1997. Opening arguments were followed immediately by the in-person testimony of one of the most critical and controversial witnesses in the current case – William “Bill” Holmes. The crowd sat in absolute silence as Holmes, in horn rim glasses, orange prison garb, and flanked by troopers, described with apparent ease his role in John Hartman’s death. He discussed attending a high school part at classmate Regent Epperson’s house, and leaving when it was “boring.” He described the plans to assault Natives, repeatedly referring to the Alaskan indigenous as “drunk Natives” as he relayed the series of attempted assaults that culminated in the fatal assault of Hartman. He described the other teenagers running back to the car, near hysteria because “little J was just trippin,’ stompin’ the old boy out.” He describes discovering a few days later that the assault proved fatal, that others had been arrested for the crime, Wallace showing off and laughing at Hartman’s blood still on his shoes, and how Holmes threatened the other teenagers present with murder should they ever come forward. When describing his motivation, Holmes insisted that God had moved him, nothing more and nothing less. Holmes proved a difficult witness to undermine for Bachman, who focused heavily on his ability to identify his route through arial photographs and his definition of “U-turn.” The line of questioning ultimately backfired as Holmes described by landmark with great accuracy the corner of 9th and Barnette. Bachman also sought to undermine Holmes’ claim of faith by grilling him about sexual conversations had via contraband cellphone with a woman. Bachman insisted Holmes could not be both coming forward for spiritual religions and ‘talking dirty’ to a woman. She ended her cross examination with a brief commentary about his testimony being hearsay, prodding Holmes with the claim that he didn’t see anything or commit a crime. Holmes responded that he thought driving the car for premeditated assaults, driving the getaway car for a murder, threatening witness/participants with death if they came forward, and destroying evidence was indeed a crime. In the end, Holmes had the better end of that argument. Most memorable in the Holmes testimony, however, was simply the easy demeanor with which Holmes reflected on Wallace “stomping the ol’ boy out.” For the many people whose lives were turned upside down when Marvin, Eugene, Kevin, and George were imprisoned for the killing, hearing the details of the brutal death of young Hartman for the first time were overwhelming. Spectators exited the courtroom visibly shaken by the Holmes testimony, and as Marvin Roberts and TCC President Victor Joseph stepped into the large crowd gathered to protest outside the courtroom, the mood turned somber. “We need to pray for John Hartman, for this little boy, and his brother who is here today. We need to lift him up,” Joseph began, and continued to urge the crowd to support the Four and continue their work. Marvin thanked the crowd, tears catching in his throat as he listed his co-defendants still in jail by name. The crowd of supporters, which included the UAF chancellor and bishop of the Alaska Episcopal church, played drum and sang traditional songs in a circle around the courthouse steps. Below are some of the many articles and videos about the first day of the Fairbanks Four proceedings. We will update you as trial continues. Frank Dayton’s mugging was only one of the similar attacks that occurred the night John Hartman was killed. However, the beating and mugging of Frank Dayton is of incredible importance because of the part it played in the police theory of the murder and the part it played in trials. In addition to being charged and convicted of the murder of John Hartman, the Fairbanks Four were also convicted of mugging Frank Dayton, primarily off the eyewitness testimony one man provided in exchange for leniency in the serious criminal charges he was facing. It was the only testimony that put the four together that night, or indicated that they were engaged in violent behavior of any kind. That testimony was made by Arlo Olson, and has since been recanted. We hope to post Arlo’s story, and are hoping that he will be able to tell it himself for us and keep with our focus on letting people speak for themselves. Either way, we will discuss Arlo Olsen’s role in this case at length very soon. For now, we will focus on Frank Dayton’s version of events. It is impossible to overstate how important Frank Dayton’s mugging became in the murder trial. In this post we will describe the mugging that Frank Dayton reported to the police and testified to in trial. Frank was at the the wedding reception at the Eagle’s Hall along with hundreds of other guests. Sometime around 1am, Frank decided to walk a few block over to meet a friend. Much like Hartman, he was walking alone in the cold late night. He was soon assaulted in a disturbingly similar way. Frank was in the 300 block of 1st Avenue when he heard a car rolling up behind him. He assumed that the car was slowed to a crawl so that it could pull into the parking lot he had just passed. When he turned around he saw the car. He described it as a four door light colored car (white, or a very light tan or gray). The assailants ran up to him and he was immediately tripped and knocked to the ground. His elbow, knees, and face smashed into the cold pavement. He made a movement to stand, but one of the attackers slammed their foot down on his right hand. Another stood over him. They kicked him in the side and back. As he lay with his face pressed into the pavement he saw the show standing on his hand – a white high top. The attackers assaulted him primarily by kicking him while he was on the ground. They reached into his pocket and took the $20 he had. They then ran to their car and sped off, disappearing as quickly as they had appeared. Frank was not able to describe his attackers, it had all happened fast and in the dark, and he was held face-down to the ground during the beating. He was able to see and remember the car well, which he described as a “good-sized” light four-door sedan. 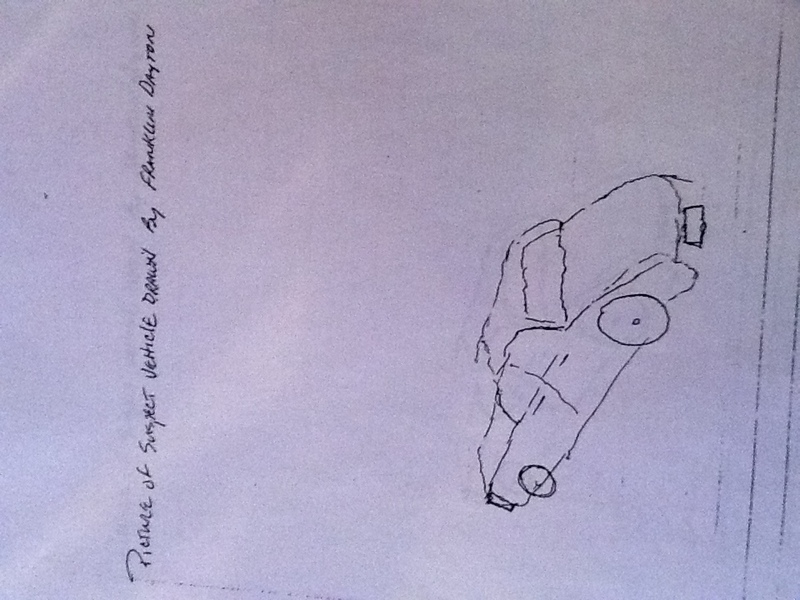 Frank even drew a picture of the car for the police, which is pictured above. In the police theory, they surmised that the Fairbanks Four – Kevin, Eugene, Marvin, and George – had gone on a violent beating spree that night attacking people at random. Indeed, there is a distressing theme in the violence that occurred that night. Three others reported nearly identical attacks which you can read about HERE. In those attacks the eyewitnesses or victims also described a light four-door sedan as the car, but the others were able to provide a better description of their attackers, and across the board they ALL described four young African American men in that light car, getting victims to the ground, kicking them, and speeding away. Frank Dayton was wearing a leather jacket than night. One that likely had the palm and fingerprints of his attackers on it – Frank offered it up to be tested, and the investigators declined to take it. There are a lot of opportunities lost in this case – Frank Dayton’s jacket was one of them, but much like Conan’s pager (read about that HERE), yet another opportunity to collect that evidence was passed up. It is a theme in the case that is disturbing to say the least. After the beating, Frank Dayton returned to the Eagle’s Hall, where his sister in law Susan Paskavan called 911. The call is logged at 1:34am, roughly the same time that the assault on John Hartman ended. * Frank Dayton’s attackers drove a light full-sized four-door sedan, Marvin drove a bright blue two-door tiny car. * None of the four were there. Read their timelines for more details (MARVIN, GEORGE, EUGENE, KEVIN). * Marvin was at the Eagle’s Hall when Frank Dayton returned and 911 was called. Gary Edwin testified that he KNOWS Marvin was there at the time because as Gary was leaning over the injured Frank Dayton, Marvin approached him and said, “What happened?” Gary responded that he didn’t know and was trying to figure it out himself. * None of the four were wearing or owned white high-tops. The shoes that the police collected from the men were listed as brown boots, black boots, and black Nike Air tennis shoes. NO white high-tops. Remember that George, Kevin, and Eugene were all arrested in the shoes they had worn. Marvin’s house was searched and all of his shoes were taken. * Frank Dayton was Eugene Vent’s cousin. It seems unlikely that Eugene, a person with no history of violence, would attack anyone, but especially his own family. It also seems unlikely that Frank Dayton would not recognize his young relative. It also seems unlikely that Frank Dayton would not be able to identify the suspects as Native given his level of familiarity with a Koyukon Athabascan accent. * Frank Dayton himself believes the Fairbanks Four are innocent, and KNOWS that they are not his attackers. He said this on the stand, and has said it for the last 14 years. Despite all of this, the Four would eventually be tried for the mugging of Frank Dayton and the murder of John Hartman in one trial. Juror’s would later say that Arlo Olson’s testimony, which convinced them that the Fairbanks Four were guilty of mugging Frank Dayton, was one of the biggest factors in them finding the men guilty.